Outstanding home built by Toll Brothers in premiere waterfront Palm Cove Golf & Yacht Club. NO mandatory membership. Golf is pay as you play. Waterfront boating with boat slips available to purchase from $20,000. Marina membership is $140 per month. Enjoy 4597 sf under air with 4 bed, 4 1/2 bath. Expansive master bedroom with his and her bathrooms, high soaring ceilings, hardwood floors in the bedrooms, fresh painted, new AC system. Beautiful new resurfaced pool with salt water chlorination. 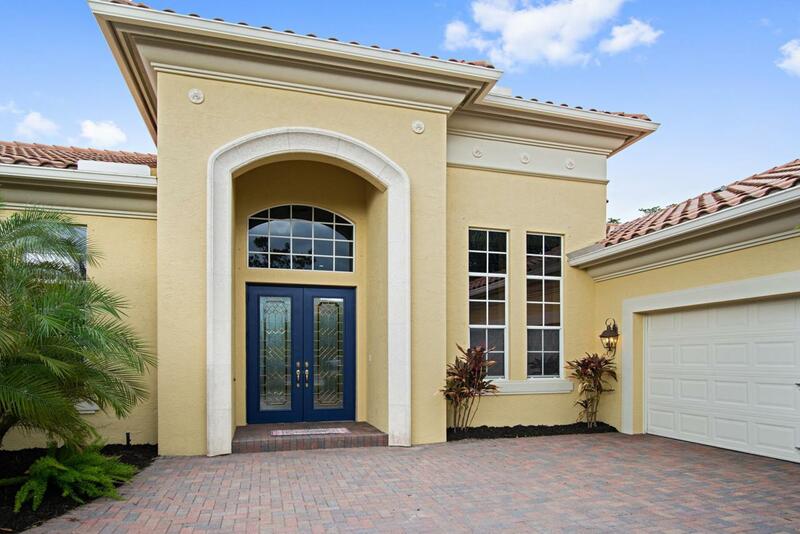 This spacious home is located on hole # 10 of the golf course designed by Chi Chi Rodriguez. This is a gated and guarded community with low HOA fees of $375 a month that include Riverfront Clubhouse, resort style heated poolfitness center, library, meeting & gam, kids area, kayak storage and paddleboard. Golf is "Pay as you Play" Boat slips avail to purchase separately starting at $20k. Buyer pays one-time capital contribution at the closing of $791.72. It also features 93 slip Marina and a non-equity Golf Course with a pro shop, driving range, restaurant and with har-tru tennis courts. Located just minutes from Historic Downtown Stuart. "A" rated public schools. Close proximity to beautiful beaches, shopping and entertainment. Minutes away from I95 and Turnpike. PBI International Airport is less than an hour away. Brand new water heater. Listing provided courtesy of Berkshire Hathaway Homesvs Fl. © 2019 All rights reserved. All listings featuring the BMLS logo are provided by BeachesMLS Inc. This information is not verified for authenticity or accuracy and is not guaranteed. Copyright 2019 Beaches Multiple Listing Service, Inc. IDX information is provided exclusively for consumers' personal, non-commercial use and it may not be used for any purpose other than to identify prospective properties consumers may be interested in purchasing. Data last updated 2019-04-25T11:03:39.69.